Of course you know crusty filo pastry and puff pastry and shortcrust pastry. Well, this is the homemade version of pastry that is thin as filo, puffs up when baked and delicious like shortcrust pastry. Good for both sweet and savoury pies it is unlike anything you will find on the shelf and it really is worth the effort. And once you master it, you’ll never look back. I had wonderful company for this one. Late in the evening the phone rang. We are making pie tomorrow, do you want to come by? Of course I do! So I spent the next day with my aunt Litsa and her mum, Marianthe, a kitchen veteran and a true foodie, even before the word had been coined. There is no recipe she cannot tackle and share a secret or two about. She’s a well-travelled lady too, Marianthe has been to Switzerland and Germany for work. Back in the days when things were rough and very different to what we know now. Everywhere she went her food made history: the Greek was cooking! I can imagine the hearty smells permeating the neighbours’ nostrils: from rabbit stews to fish bakes and of course homemade pies. It’s hard to describe what it is like spending a day with such a wonderful person. I am not only grateful to Marianthe for being such a patient and wonderful teacher, but also humbled by her wealth of practical knowledge, her simplicity and the love she puts in everything she does. She still remembers the old ways of doing things. There was a bit of reminiscence about the old days in her village, Soufli, up North. How her dad used to tend to the land and all the wonderful treats he would make sure the family had to see them through winter in the era before supermarkets and chocolate. They would make tahini and petimezi and pickles, just to name a few things. Start with the pastry and allow time for this. It’s quick to make but the dough will need to rest for at least 30 mins. The more you leave it the easier it’s going to be to roll out. So in a bowl of warm water, add the olive oil and bit by bit the sieved flour. You are aiming to knead it into a firm, but supple and not watery dough.This might take a little more than 1 kg of flour, so it’s best to have some extra at the ready. All the ingredients should bind smoothly. How do you know it’s ready? It will not stick to your hands or the bowl. If it gets sticky just sprinkle a bit of warm water on your hands and keep on kneading. 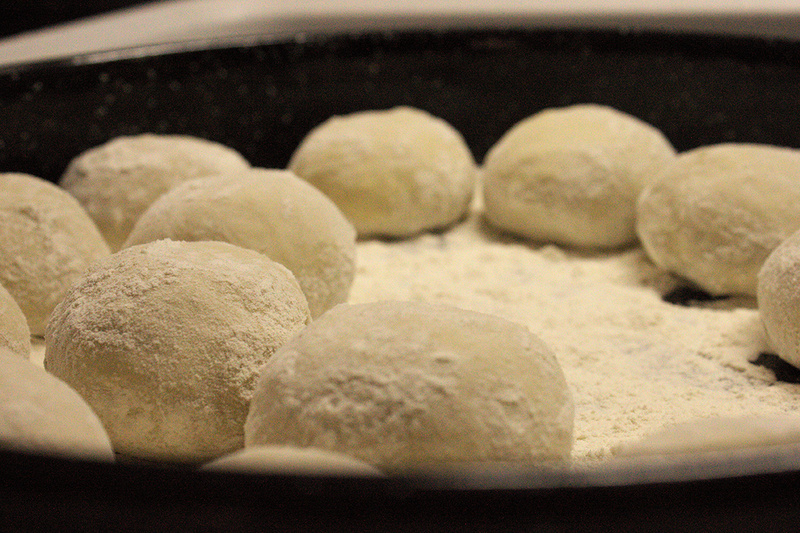 Once done, separate the dough into 7 equally-sized balls and dust with flour. Cover them and let them rest for at least 30 mins. Rolling out the dough into the pastry sheets. Clear and clean a large work surface. It takes a lot of space to do the pastry and also to store until all is done. The kind of rolling pin you use is important here, it should be long, approx 1m and 1.5 cm thickness. It might be hard to find such a stick handy, but there is always the good old broomstick if you’re stuck! 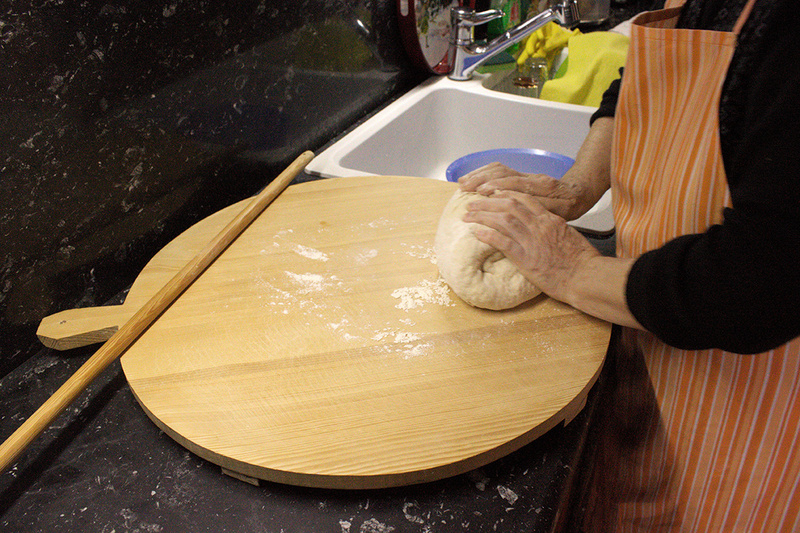 Dust your surface with a bit of flour, lay down your dough ball and flatten it a little with your hand. Dust with more flour again and you are ready to roll: Start rolling from bottom to top, then right to left, making sure you roll from a different direction each time. Roll the pastry around the rolling pin tightly and as you move along push firmly and evenly from the centre towards the outside of the pin. Unfurl the pastry from the rolling pin and change direction. Make sure you have a nice surface lightly dusted with flour as you go along, that’s the extra flour I was talking about before. You want the final sheet to be round, really thin and even. Almost see-through. If you make some holes in the pastry fear not, just dust on a little more flour and roll again. It will make no difference to your end result. Keep on rolling from different directions. Here’s a little beginner’s advice: if you make a mess of one sheet, like lots of holes (as I did), don’t re-knead the dough. It’s impossible to bring it back to the initial stage, so just discard it for a fresh batch. Quantity: these should make around 7 sheets of pastry. Crack the eggs and crumble the feta, add some pepper and mix with the yogurt and olive oil. It has so many eggs, we traditionally call it egg pie instead of cheese pie. And there’s no need for salt either, because your feta should provide enough. Normally we do this in a large, round baking tin. Brush it with butter and start laying out the sheets, alternating between pastry and filling, pastry and filling until you use up your ingredients. Every sheet has to be brushed with a bit of olive oil, be generous, the pastry will thank you for it. Also, don’t stretch the sheets; they need to be comfortable, rippling as they cover the tray. For the filling, try to sprinkle a little bit more towards the edges of the baking tray as the pastry sheets make more folds there. Baking time: this is a huge pie, the recipe makes approximately 22 pieces, so allow for 1 hour at 180 oC in a fan assisted oven. And here it is: crispy on the outside, soft inside and enjoyed hot or cold.